Brewing a cup of fennel seed tea is an excellent way of enjoying this often underused, yet extremely healthy spice. This recipe also makes use of the feathery leaves; this is optional and the crushed seeds alone make a great drink. This recipe uses caraway seed, again a healthy, underused spice. If you don't have caraway available, just double the amount of fennel. Lightly grind in your coffee milll or crush the seeds in your pestle and mortar. Add to a saucepan with the water. Heat to boiling, turn down the heat and simmer for 4-5 minutes. Add the orange, and, if using, the chopped leaves and let steep for another few minutes. Pour through a strainer and enjoy. 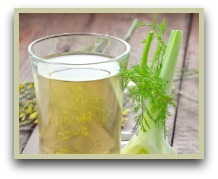 Click here for another fennel seed tea recipe. ...Like most drinks made with spices and herbs, it contains a range of beneficial antioxidants, vitamins and minerals. It's long been used to ease bloating and constipation. Apparently a teaspoon of the cooled down tea is a cure for colic in infants. Cooled down, it also can be applied to an inflamed eye. And due to its strong aniseed flavour, this is an excellent spiced tea for combating bad breath. Turmeric Infusion - Probably the healthiest spice in the world! Tea With Green Cardamom - Cardamom is also known as the "Queen of Spices"